Want to know in which part of Texas is Lubbock situated? You would get exactly what you are looking for by referring to the West Texas Cities Map. What makes this map different from the rest of the pack is the accurate locations of the cities presented in a very clear and precise manner. Some important cities such as the City of Midland, and Plainview are featured in dark dots while other cities are shown in simple dots. The international border demarcates West Texas from the neighboring country of Mexico. The neighboring US state of New Mexico and Oklahoma are also depicted on the map. The user will get to know the extent of West Texas as borders are drawn on the map which demarcate it from North Texas, Central Texas, South Texas and the Panhandle. 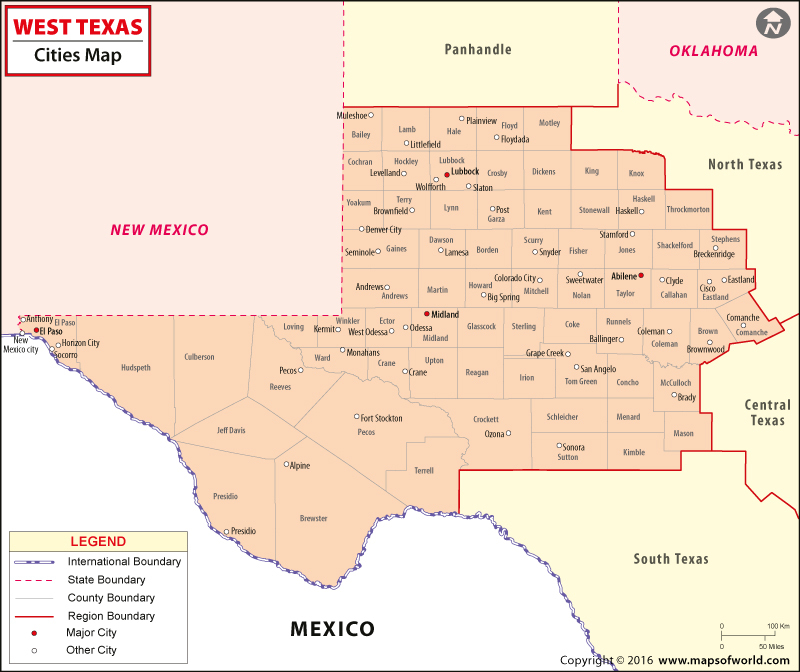 West Texas comprises some 70 counties. Some of the main industries of this part of Texas are livestock, textiles and petroleum and natural gas production. West Texas is also known for its large number of wind turbines that are providing alternative and clean sources of energy. The West Texas Cities Map is a rich source of information for students, teachers, researchers, travelers, geographers and just about any one who needs a map.